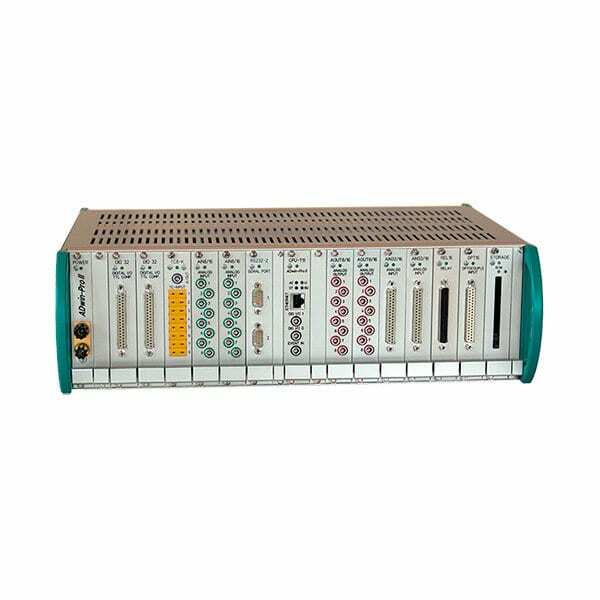 The ADwin-PRO-II Modular Real-Time Data Acquisition System is the successor of ADwin- Pro product family. The new T12 processor provides much faster operation and transmits data 10 times faster with the new Pro II bus. The PRO-II backplane support both the new Pro II I/O modules and the older Pro I modules. Pro-II systems offer the new T12 processor module which uses the Dual-Core ARM Cortex-A9. With 1 GHz clock speed and 1 GB of internal memory for program and data, the PRO-II’s processing power over 4x previous models. In addition, the processor’s 64-bit internal calculation enables double precision floating-point calculations. The T12’s accelerated Ethernet interface enables high-speed data transmission to the PC at more than 1 Gb/s. The bus bandwidth of up to 200 MByte/s significantly increases the capacity of the internal traffic between the processor module and the new Pro-II output modules. For all its superior performance the ADwin Pro-II remains compatible. On the backplane, both the new Pro-II and the present Pro-I bus work side by side so that all the existing input and output modules can be used. The data exchange with the PC is fully compatible to work with all the interfaces (for VB, Matlab, etc.) as usual. Valuable ADbasic source code can be reused after just a few changes to the tried and tested algorithms which also benefit from the PRO-II’s higher processor speed. The new Pro-II system’s extraordinary speed enables applications demanding a high data rate. In addition, the fast T12 processor allows an intelligent pre-selection of relevant data, mathematical functions or digital channel filtering. All new Pro-II modules run on the Pro II bus automatically sync. This allows fully-synchronized time measurements from multiple modules without any special software effort. The ADwin-PRO-II Modular Real-Time Data Acquisition System is available in the usual variety of robust housing for various applications: as a desk system for the lab, a portable system for travel or as a system for panel mounting. The system’s 5-16 slots and ADwin’s wide variety of different modules are the ideal, flexible foundation for rapid real-time applications. The T11 processor module is the heart of the ADwin-II Pro system. It leads into the programmed commands in ADbasic and also accesses the inputs, outputs, and interfaces of the other modules. ADwin’s Pro-CPU-T11 and Pro-CPU-T12 processor modules offer the most powerful real-time computing power and are largely software-compatible to previous versions. The Multi-I/O-Modul MIO-4 for ADwin Pro II is the self-sufficient all-rounder for all signal types: it combines the responsive TiCo processor with analog and digital inputs and outputs. Thus, the intelligent plug-in card independently respond to readings and events, and free the CPU, for example, as a fast controller, digital filter for analog signals, function generator and intelligent supervision limit. For a wider range expansion Mio4-ET1 with counters, SSI decoder and EtherCAT interface . The analog input and output modules for ADwin-Pro II , the interfaces with your instruments, analog transmitters, amplifiers and actuators. They are ideal for the rapid solution of time-critical and real-time tasks. The processor module per-CPU-T11 uses the ADwin-Pro II bus with up to 200 MB / s on the modules. 16-bit module: Optional averaging of a defined number of measurements. The analog output modules allow for synchronous data output to 4 or 8 channels without time delay. The DAC has a resolution of 16 bits and provide a wide bandwidth. Digital input and output modules are the interfaces to your digital gauges and transmitters. Select the digital modules to suit your type of signal. The ADwin Pro -counter modules can be, for example, for connection of incremental encoders, the event count or pulse width modulation. ADwin Pro modules work with a variety of bus and serial interfaces. 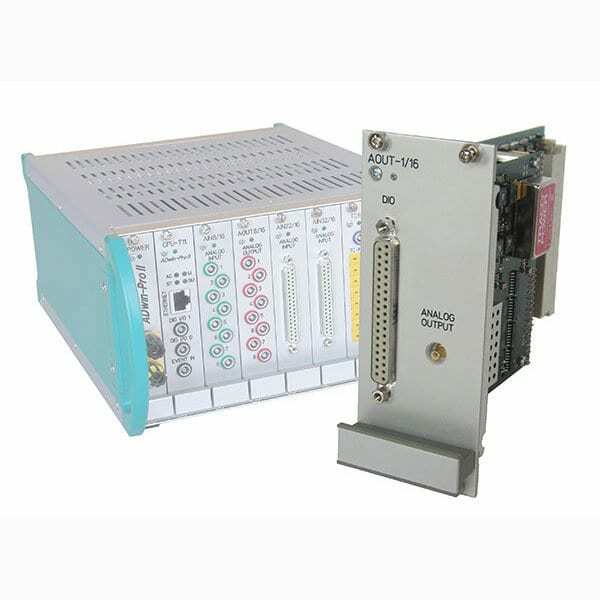 A ADwin Pro -system can simultaneously send messages and data via RS232 control via CAN-Bus devices and control a test. Pro-CAN II-2: 2 x CAN bus, Low-Speed ? ?or High-Speed ?? (CAN 2.0 Part A + B, ISO 11898), triggering a CPU through a CAN message event possible; module is TiCo equipped. The temperature module-RTD-8 Pro II converts signals from Pt temperature sensors with analog-digital converters (ADC), allowing the query either the temperature or the applied voltage. All necessary settings can be configured by software. On the module performs a sequence control data acquisition, which relieves the main processor of the Pro II system greatly. The module can also automatically signals a defined (interference) frequency signals from the digital filter. The temperature module TC-II Pro-8-ISO converts signals from standard thermocouples and used to check the temperature or the applied voltage (with and without cold junction compensation). All necessary settings can be configured by software. On the module performs a sequence control data acquisition, which relieves the main processor of the Pro II system greatly. Multiple PCs can communicate with one ADwin system concurrently. This may be useful during the program implementation and comissioning. On the other hand, one PC can also access multiple ADwin systems e.g. in a network for a centralized monitoring of various applications. While working with ADwin, the first step is always to download the real-time operating system to the ADwin system via the Ethernet or USB interface. Then, the ADbasic real-time processes can be loaded and started or stopped as required. Single values or whole data sets (arrays), e.g. measured or set-point values can be exchanged bi-directionally. The deterministic (exact and predictable in time) execution of the real-time processes is not affected by the communcation between ADwin and the PC. With ADbasic, you define the processing sequences that are executed on the ADwin hardware. ADbasic optimizes and compiles the program code on a mouse-click. After being loaded on the ADwin system by ADbasic or a graphical PC user interface, the real-time processes execute independently. ADbasic contains the functions to access all inputs and outputs as well as functions for floating-point operations, process control and communication with the PC. A library is provided which contains standard functions e.g. for filtering, various examples for counter use, closed-loop controllers, function generators etc. which leads to a faster program implementation. By means of the easily configurable ADtools you are able to display your real-time data graphically or numerically, to visualize process sequencings or to set input values via potentiometers, sliders or push buttons. Additionally, ADtools always provide you with the current status of your ADwin system resources.